James F. (Jim) Logan, Jr. is the President of Logan-Thompson, P.C. 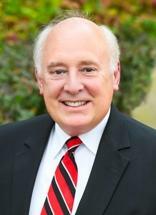 He has been a practicing attorney in Cleveland, Tennessee since 1971. Logan is married to Cindy Logan. Mr. Logan and his wife are members of the First Baptist Church of Cleveland, Tennessee where he sings in the bass section of the First Baptist Choir. Mr. Logan is active in various state and national bar associations. He maintains active memberships in the Tennessee Association of Criminal Defense Lawyers, National Association of Criminal Defense Lawyers, Tennessee Association for Justice, America Association for Justice, Tennessee Bar Association, American Bar Association, American Board of Trial Advocates. He has served as a board member of TAJ and TACDL. He was a member of the board of directors for Federal Defender Services of East Tennessee for many years. Mr. Logan has served on various commissions including the first Tennessee Judicial Selection Commission on which he served a twelve year term from 1994 until 2006. Logan also served as a member and reporter of the Tennessee Criminal Sentencing Reform Commission which authored the TN Sentencing Reform Act of 2005 correcting the Blakely defects in the TN Sentencing Law. Mr. Logan is the County Attorney for Polk County, Tennessee and, along with Robert Thompson serves as litigation counsel for Bradley County, Tennessee. Logan has been honored by many Who’s Who organizations and has been selected as one of the “Best Lawyers in America,” “Best Lawyers in the U.S.” and a recommended lawyer by various recommendation services. In addition to these honors, Mr. Logan was voted best attorney in Bradley County in the year 2012 in the "Best of Bradley County Reader's Choice Awards."